The present male fashion trend for going sockless might look great (although we at SockShop don’t necessarily approve – ahem!) but it’s not always that comfortable. 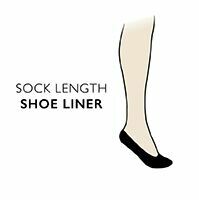 Step into these BOSS Plain Invisible Shoe Liners however, and you’ll be fully covered against pinching and rubbing. These low-cut footlets come in a high quality cotton rich blend with special silicone appliqués at the inner heel to keep them securely in palace. The comfort levels are upped still further by hand linked toes for smooth seams. A contrasting colour woven logo on the sole completes the high-quality design of these BOSS Shoe Liners – although no one but you will see them!